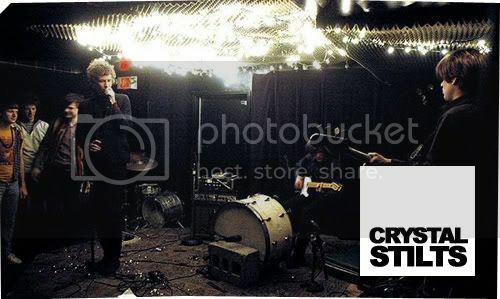 Brooklynites noise-makers, Crystal Stilts have often drawn comparison to vintage rockers the Velvet Underground as well as early Interpol. A comparison that you’ll find me strongly being in accordance with, regardless of the fact that I haven’t a clue how early Interpol sounds like. 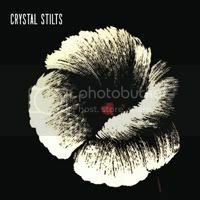 But learning to adore the music by Crystal Stilts isn’t quite the easy feat, even for someone like me who takes pleasure in woozy melancholia that’s soaked through in a thick coating of fuzz and distortion. Comparing Brad Hargett’s vocal to Joy Division’s frontman Ian Curtis is a careless misinterpretation I think. For starters, the one clear difference is that the music of Joy Division is rarely drowned beneath massive layers of reverb. And although Curtis and Hargett sings with the same low, toneless baritone, Curtis puts enough vigor into his singing to keep the audience intrigued and excited at all times. Hargett just sounds as if he’s about to fall of the stage. But having said that, after giving the album that several spins it deserved and finally learning to look pass the morose, limp, languid mumbles of inaudible singing, is when the music really starts to take off and all you hear is the stunningly hypnotic sounds of the farfisa organ and the murky shimmers of their swinging riffs. This album might just be a frontrunner for one of the best albums of the year. Just.